Tomorrow, 26 May, Casey and I will begin Trip 17 which will ultimately include 12 people and transpire over 2 months. We have a diverse team including teachers, college students, an eye Doctor, and us regulars. The youngest is 16, several are first timers to mission trips, and some will incorporate the results of their work in their Graduate thesis. We will be working at the Stream of Hope Home in Uganda, the Lord’s Servants Home and Academy in Kenya , and visiting a Pastors Training College working in the border region with the Teso people. One of our projects will be installing a water tank that will allow treated drinking water to be available to the community around the SOH home. This was funded by fund raising efforts from Ms. Spencer’s awesome 4th grade class at Patriots Elementary School who have been studying about water crisis’ in the world. We will also be installing additional solar panels at SOH, building a playground at the LSA School, several smaller projects, meetings to chart the future for the orphanages and school, lots of child educational programs, social efforts with the kids involving art therapy discipline, lots of community support activities following up on previous trips, and equipping church planters in the Teso region with audio Bibles in their language and solar powered video equipment to show the Jesus Film, courtesy of Campus Crusade for Christ. We thank you in advance for your prayers for God’s guidance, wisdom, and provisional safety and for our families that are back home. Look for my frequent (hopefully) blog updates. Basketball court and the SOH Globetrotters…. Shelter for outside gathering in the shade. 18′ x 18’…. New desk for Paul, new BBQ Grill for the Americans…. New generator to power the water well when the sun is not shining. This will eliminate water shortages and allow the distribution to the community more regularly. The team enjoyed nightly visits to the community, praying for the sick and sharing about Jesus. This was well received and influenced the high attendance for the Jesus Film showing. The Stream of Hope Home is beginning it’s 3rd year at the property purchased near Biasi, Uganda. The community has seem amazing things happen, buildings going up, children given hope, church revivals, community service, and fresh water supplied. These are all passive illustrations of the love of Jesus working in practical ways. On this trip, the team has made active evangelism efforts into the community to tell people the “Good News”. Their words have credibility due to the ministry’s loving actions. Here are a few updates from Ed and Greg at SOH……. Wednesday night we played the Jesus video (in the Lugandan language) which chronicles the ministry, death and resurrection of Jesus. Because of the outreach into the community, I counted over 150 people in attendance. When the movie came to the part where Jesus was resurrected, the entire audience went wild with clapping and hollering. After my initial astonishment, I teared’ up as I realized that they got it. ….on our witnessing yesterday we met a man that was dying and he believed he had been cursed by demons. As he lay there naked in his own urine, we layed hands on him and prayed the demons away (Paul was not along so I had to lead the prayer, way out of my comfort zone). I will go back to see the man today. …..pray for this man. He is dying and needs peace and a savior. Edinasi, Greg, Jon, and Nathan with one of the “gift” chickens. The team has been at the Stream of Hope Home this week and have been doing well. Ed and Geri will be traveling back to the US tomorrow and Sandi back to Kenya for a few more weeks. Nightly community walks and evangelism visits lead to a standing room only crowd to see the Jesus Film in Lugandan last night, shown in the SOH dining hall. Greg reported that one woman was so happy that they visited and spoke to her about Jesus that she gave them 3 chickens for egg laying. Please pray for travel mercy and for the community to be open. 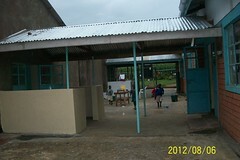 Here are some photos of the open air shelter, new basketball court, and kids.